Ah, jumping. Exhilarating, exciting, ever so much fun; as far as I'm concerned, it's the best part of the ride. It's not the only part, though; the jump itself only lasts as long as you're in the air. Between fences, on the approach, and on the landing your flatwork comes into play. If your flatwork is lacking, your jumping will show it. Your horse also must be prepared, must be physically and emotionally able to jump. Too much work or too much at once can fry his brain, and it's a long road back once you make that mistake. As long as you take precautions, you can enjoy the experience. Taking the proper precautions involves: getting lessons to learn how to ride the jump, staying balanced and straight over the jump and on the ground, being a kind rider (and not yanking his teeth over the jump), and being sure both to build up your horse's strength and to never over-jump him. When a horse jumps, the rider must follow the movement of the horse. I discuss just what the horse does as he goes over a jump, and how the rider should respond. Step by step discussion of how to introduce a horse to poles and crossrails. Further discussion of how and when to remove placing poles, increase jump height, and add additional obstacles. When a horse rushes at, or after, a jump it can be very disconcerting to the rider. It's important to realize that the horse probably isn't very happy about it either; rushing is usually a product of anxiousness or anticipation, or a lack of balance. Helping the horse balance properly and teaching him to listen for your aids, rather than anticipating, will help you move away from the rushing behavior. Jumps standards are *expensive*. But they're such a great design; they really work very well. There aren't many alternatives, though there are a few; for example, one is an attachment that hangs off of a barrel, quickly converting it into a jump. 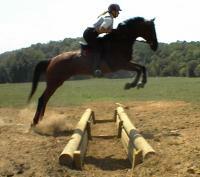 Still, if you need jumps, it's easy and simple--and inexpensive--to make your own schooling standards. Here's step-by-step instructions.